Got on TMZ today. Topic was about George Zimmerman being on a celebrity boxing event. Harvey believes that George is a media fame whore and seeking out publicity. My opinion is that the media made George Zimmerman a story, when there was no story. The media is keeping the spot light on him. We should just leave the guy alone. He was found not guilty and nothing happen. CNN tried to pump up the story hoping to see riots in the streets. Nothing happen when he verdict came out and we should just give George his privacy back. I had another 10 minutes of fame talking with Tom and Tony. They host an online network devoted to talking about the markets. It's nice to talk to people that know what you are talking about. We first start talking about my latest trade in UVXY. A 3X levered fund that is long the VIX future's contract. Then we talk about the market in general and there thoughts about my observation of them being wrong about the markets all last year. 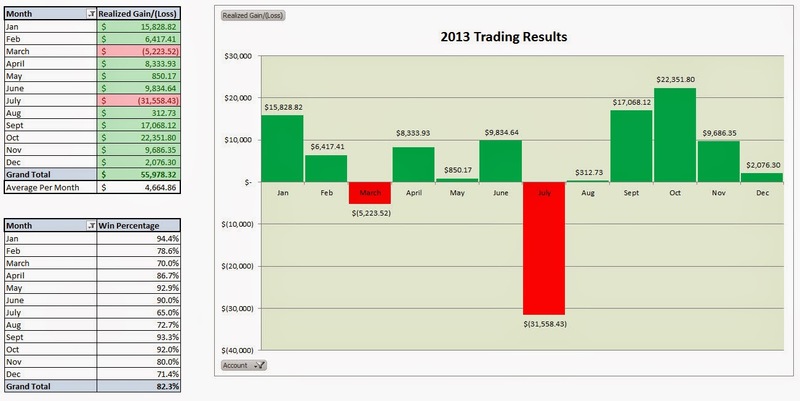 Time to review my 2013 trading results. It was the best year in trading ever for me. I made almost as much as I took in from my full time job. I averaged $4,665/month in profits between my main brokerage account and IRA account. I had a 82% win rate with 256 completed transactions. An 82% win rate is statistically about what you would expect from a strategy of only selling option premium. If you just buy a stock you can statistically expect to win 50% of the time. Since you only win if the stock goes in your direction. As an option seller, you generally have a 80% win rate, since the option buyer has to get 3 things right to make a profit. The direction of the stock, the time frame for the move and an exact price to reach. This is all statistically very hard to do! So I rather take the opposite side of that trade and win 80% of the time. Of course for that high probability, win rate, the cost is higher risk of capital loss. I have a higher probability of winning in most of my trades, but the amount of the win is small. When I lose, I could lose allot more, since I'm taking on more capital risk. When reviewing my transactions I have many small wins and very few losers, but a few of the losers were huge! $3K - $14K, luckily I had many more small winners to make up for the big losses. My average win per trade was only $218. But since I had 256 transaction that is still $55978 in total profits. The moral to this story is to trade often, trade small and minimize your losses!